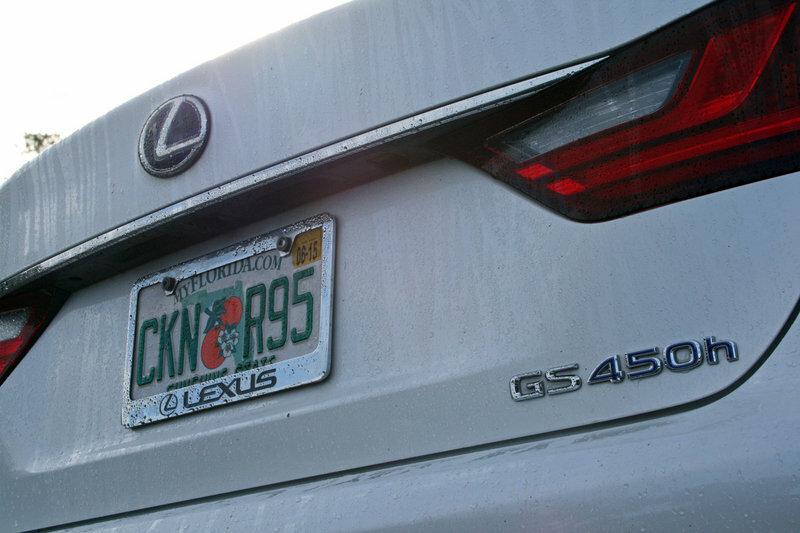 Mark McNabb spent a week with the large, luxurious, AND fuel-efficient Lexus GS450h. 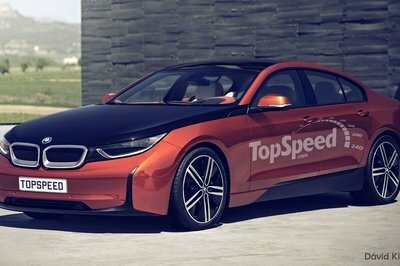 Check out what he thought of it at TopSpeed.com. “Sport” and “hybrid” aren’t often found in the same sentence when talking about anything this side of McLaren, Porsche, and BMW, but Lexus makes that claim with its second-largest luxury sedan. Things gets plausible when considering the GS450h comes with 338 horsepower thanks to a 3.5-liter V-6 and a pair of electric motors – all of which power the rear wheels. Despite not coming equipped with the optional F Sport package, the G450h still comes with an adjustable suspension and various drive settings that allow for a range of driving feels, spanning from Eco to Normal and Sport to Sport+. Even the gauge cluster modifies itself to suit the mood – switching from an eco gauge to a full tachometer. You may recall our own Christian Moe’s review of the GS450h back in the fall. He walked away pleasantly surprised at the car’s ability to coddle occupants in luxury while getting decent mileage with horsepower in reserve. Surprisingly his tester and mine came equipped with exactly the same options, even down to the paint color. Only eight GS sedan separated our cars on the assembly line as the VINs were only separated by a factor of 10. While Moe has the beauty of curvy back country roads snaking through the hills of East Tennessee, I make use of near sea-level lands in central Florida. Would the scenery and altitude change the GS450h’s behavior? How well does a child seat fit in the back? Two questions among many I aimed to answer during my week with one of Lexus’ premiere hybrids. 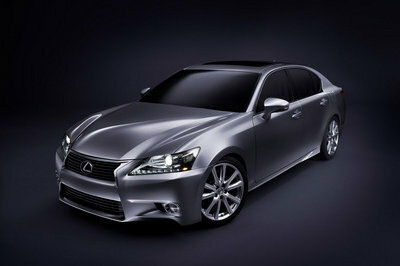 The Lexus GS is a large sedan falling in line beside the BMW 5 Series and Mercedes-Benz E-Class. Its wide footprint and long stance makes for plenty of room for design cues and interesting shapes that are noticeably absent. Lexus designers definitely took a very conservative approach to the GS. Even its spindle grille is subdued in comparison to the IS and RC sedan and coupe. Checking the F Sport box on the order form definitely adds some much-needed spice. Then again, Lexus is probably extremely smart for offering two appearances for its sedans, catering to the different buyers that frequent Lexus showrooms. Among the exterior options are the beautiful 19-inch alloy wheels, LED daytime running lights and bi-xenon headlights, moonroof, and power-folding side mirrors. The Starfire Pearl paint shimmers brightly and takes different hues as the sunlight traces across each bodyline. 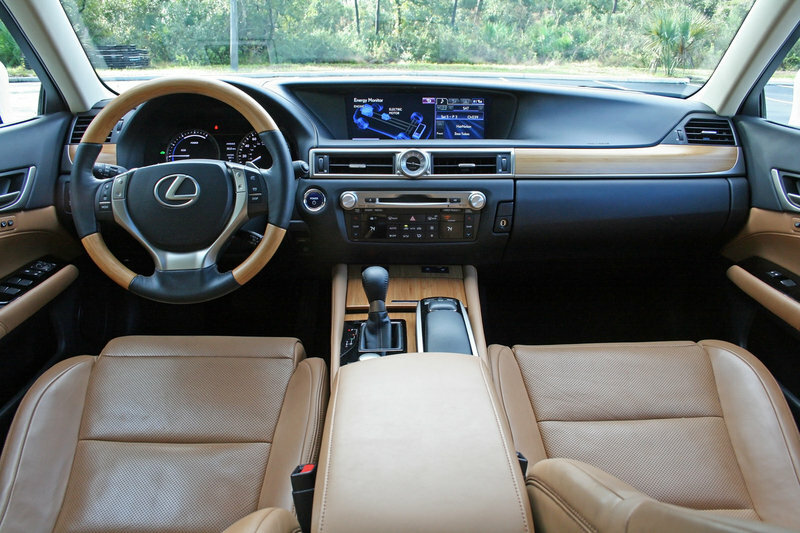 Peanut butter and chocolate – the though immediately crossed my mind as soon as I slid into the GS450h’s cabin. 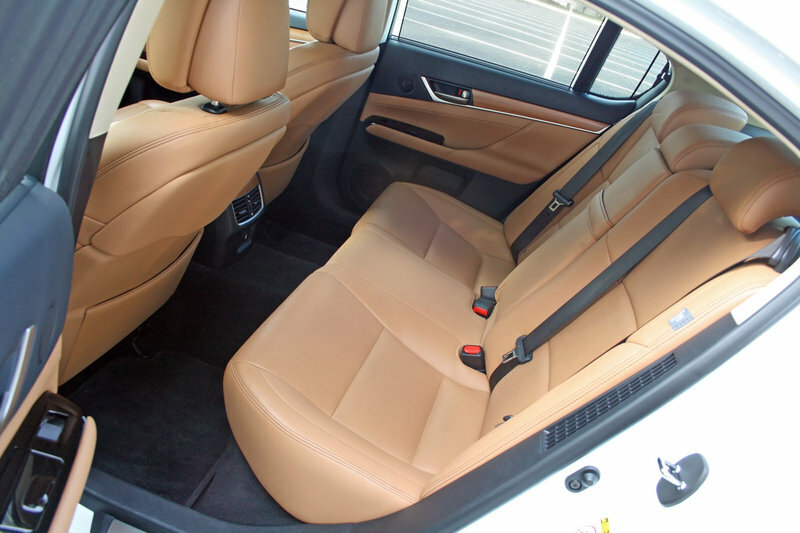 The brown leather seats, door panels, and accent leather match up nicely with the bamboo trim pieces. The majority of the dashboard and parts of the door panels are covered in black, soft-touch plastics. Satin chrome accent pieces are littered throughout the cabin. The looks garnered both negative and positive reactions from friends and family, and nearly everyone’s response was polarized in either direction. Thankfully the front seats are fitted with both heaters and vents, making the fluctuating “winter” weather in Florida more bearable. 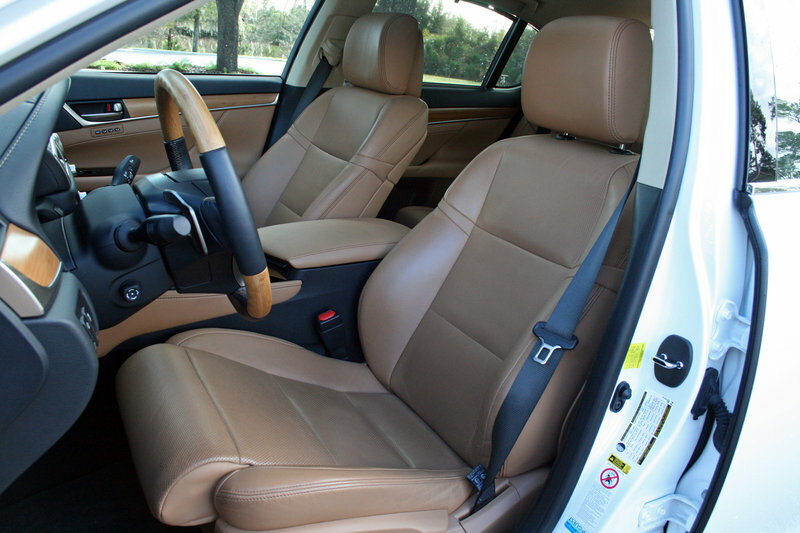 The front thrones were very comfortable and adjustable in nearly every direction. Rear-seat passengers were treated to plenty of leg and hip room, though headroom will be compromised for those over six feet. And as far as the child seat, there was plenty of room for my three-year-old. The large rear doors provide plenty of space to enter and exit the rear bench and maneuvering the bulky child seat in and out of the car. Technology is a big deal in the GS. It comes with a massive 12.3-inch center infotainment screen that displays information in a split-screen view. 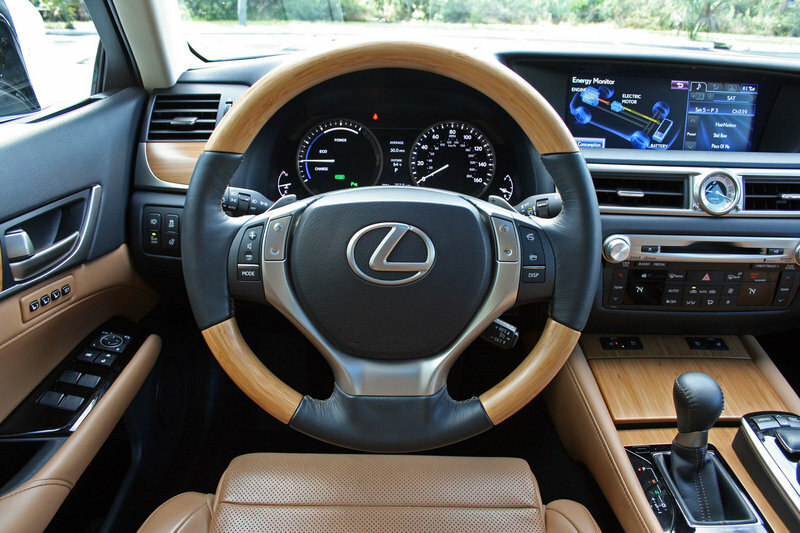 The Lexus Enform system works well, though it is starting to look rather dated. Included on my tester was the $900 Heads Up display. It worked well for telling speed, but its bar-type tachometer was entirely too small to read. Overall the interior exudes a high level of class and posh with plenty of room for four adults. 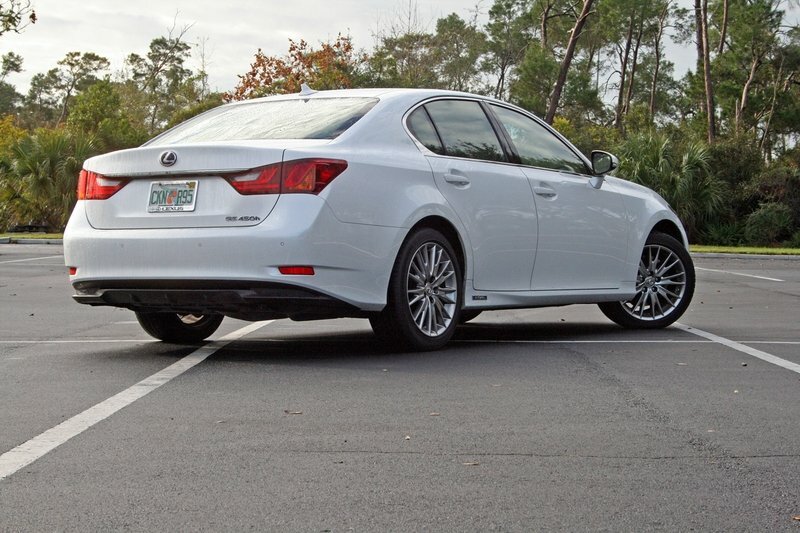 Behind the GS450h’s spindle grille lies the familiar 3.5-liter V-6. 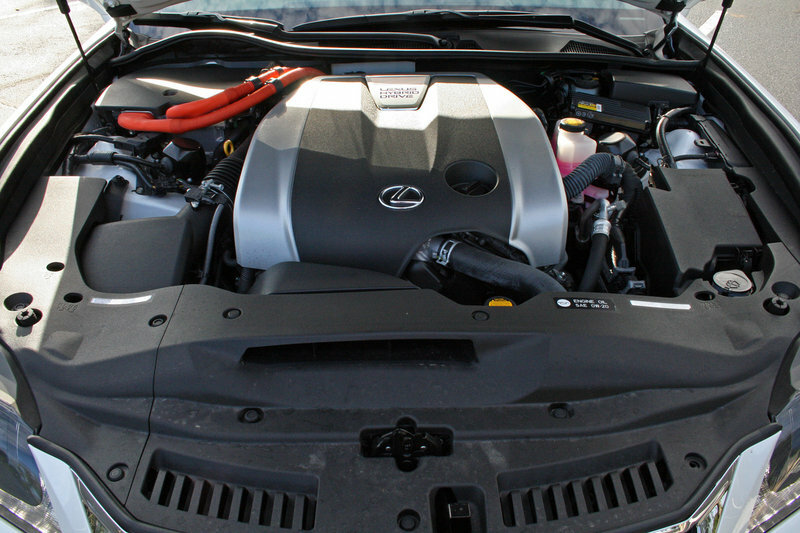 In this case, it’s somewhat down on power compared to the standard GS350 by 20 horsepower. Its Atkinson cycle works to maximize fuel efficiency while two electric motors work to make up the power discrepancy. The first motor is located under the hood and works primarily to charge the battery while the second rear-mounted motor helps power the axle. 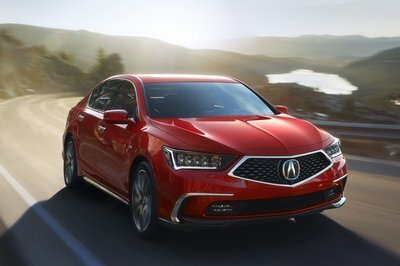 The 52-horsepower motor boosts the 286-horsepower V-6 toward a 338 combined-horsepower rating, making it the most powerful sedan in the GS lineup. Drive like you’ve got an egg under your foot and it’s possible to return the EPA’s estimated 29/34/31 mpg average in city, highway, and combined driving. Most of my driving was smooth, though a few times that egg was squashed by a brick. I ended up averaging 30 mpg in mostly mixed driving. That’s the same average Moe laid down with his identical GS450h. The gas and electric powertrain combination led to some respectable performance. Launching to 60 mph took only 5.7 seconds and highway passing happens quickly. That’s surprising considering the GS450h uses a CVT. Admittedly, this must be one of the best-tuned CVTs on the market as the “rubber band” effect was non-existent. Power rolls on quickly and smoothly, though without much lag. Only under hard acceleration is the absence of hard shifts missed. The car does offer paddle shifters for simulated gears, though I found it more rewarding to just let the transmission do its job unimpeded. Piloting the GS450h around is a superbly pleasurable experience. When lackadaisically driven, the car settles down into a sedate manner that wafts passengers down the road. In the Eco or Normal settings, the suspension is soft and compliant – keeping bumps and expansion joints at bay. Even still, body roll is well controlled. Turn the selectable drive mode knob to Sport+ and things change. The suspension firms up, the engine is more responsive, and the steering quickens up. The car becomes more alive. Pressing and holding the traction control button allows for tail-happy fun with the long sedan. 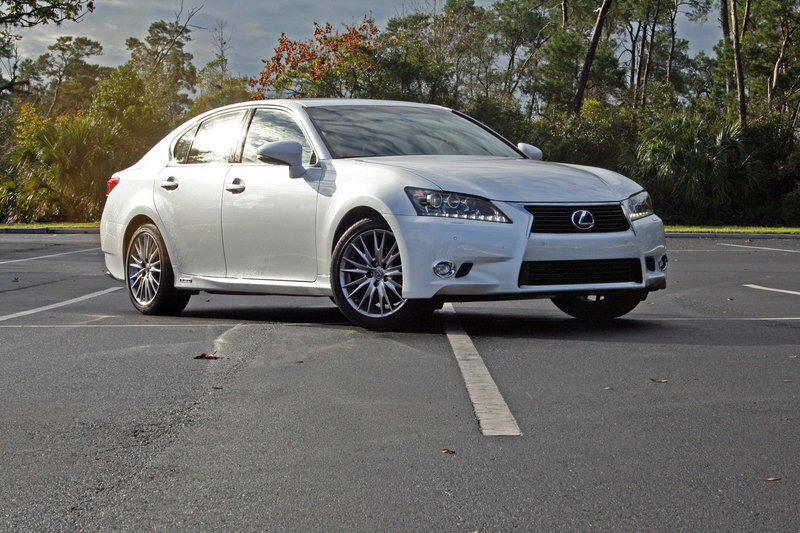 You won’t mistake the GS450h for a performance sedan though. It still has a somewhat disconnected feel between driver inputs and the car’s reaction. A quicker steering rack and throttle response (even more than what Sport+ offers) would make a big difference. Regardless of the GS450h’s power and performance capabilities, it’s most happy trotting down the highway in Eco mode getting 34 mpg. Road trips are what this car lives for. Good outward visibility, comfortable seats, and good ergonomics makes hours behind the wheel simply fly by. Skip the option boxes and Lexus will trade you a GS450h for $59,600 before deliver fees and whatnot. My tester, however, came loaded out with $9,490 worth of extras. They included the Blind Spot Monitor, Heads Up Display, the Luxury Package, the Navigation Package, the one-touch power trunk, and the Intuitive Park Assist. Add on the $910 delivery fee for a grand total of $70,000 even. Perhaps the best-known stalwart in the segment is the BMW 5 Series. The Bimmer has a bevy of optional engines, including the 3.0-liter, V-6 turbodiesel. 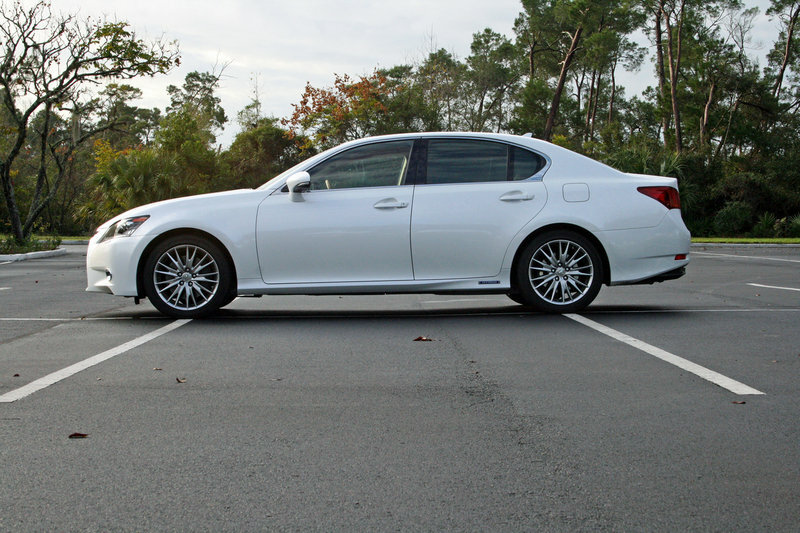 At 255 horsepower and 413 pound-feet of torque, the 535d doesn’t offer the great straight-line performance the Lexus does, but does surpass the GS450h’s ability to sip fuel. The turbodiesel gets 38 mpg highway. Besides the diesel, BMW is rumored to have a plug-in hybrid 5 Series in the works for 2017. 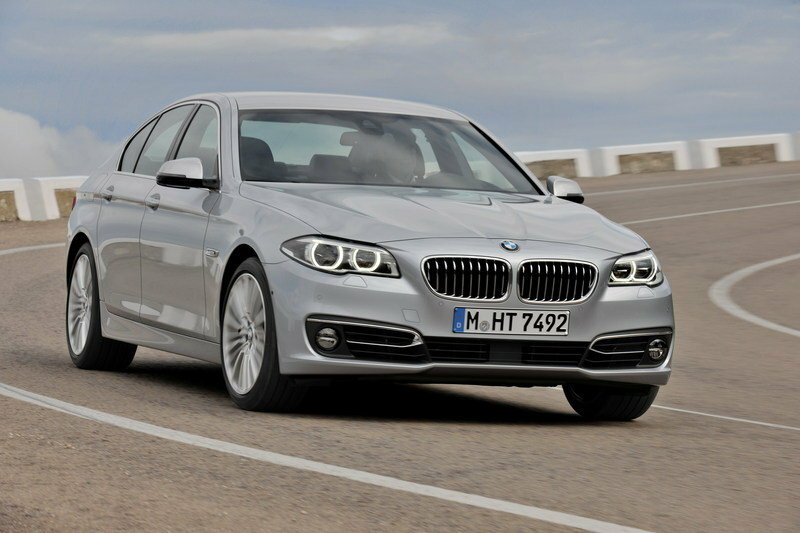 Pricing for the BMW 5 Series starts at $50,425 for the base car, while prices for the 535d start at $57,525. Mercedes also offers turbodiesel version of its popular E-Class, but more closely related to the Lexus, Mercedes offers a hybrid version as well. 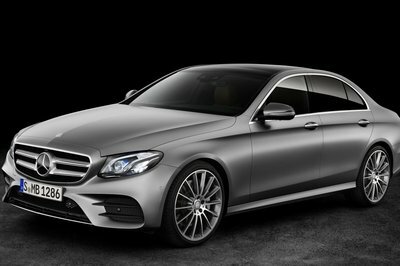 The E400 Hybrid comes motivated by a 3.5-liter V-6 with 329 horsepower and 457 pound-feet of torque. The EPA estimates the E400 to get 24 mpg city and 30 mpg highway. Unfortunately that doesn’t match the Lexus nor BMW’s numbers. The diesel, however, offers 28 mpg city and 45 mpg highway. 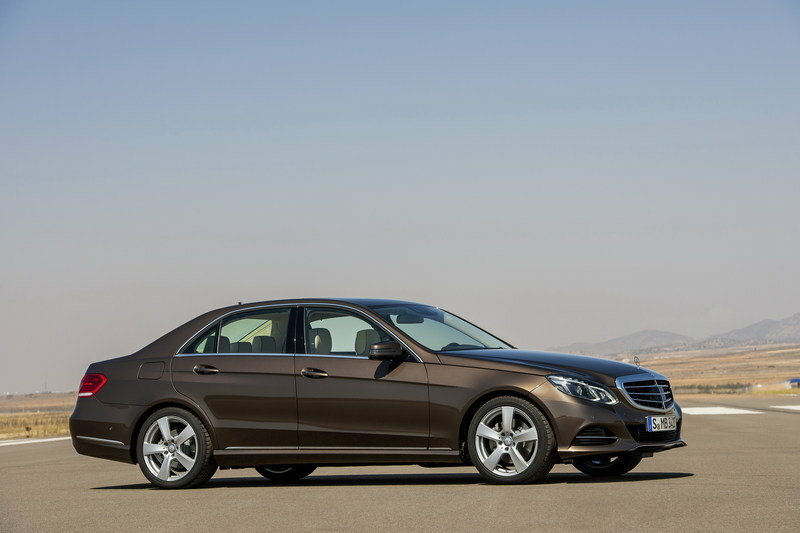 Prices for the E400 start at $56,700 while the E250 BlueTEC turbodiesel starts much lower at $51,400. 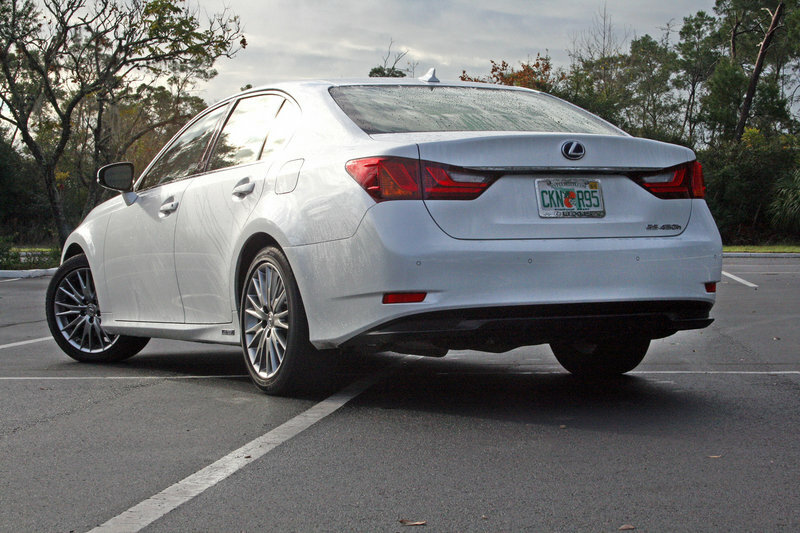 The Lexus GS450h proved to be a grown man’s Prius without the odd stereotypes. 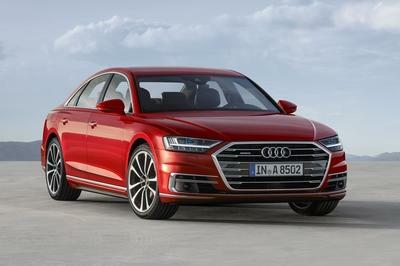 It works well at chauffeuring occupants around in cushy comfort while still proving plenty of power and suspension firmness for those times when “driving green” isn’t on the menu. The extra features and amenities offered on this tester make it a great ride for those tech-friendly customers, though the options quickly inflate the price. The GS450h is a great alternative to the German and growing American auto brands, but I can’t help but ponder how long it would take to earn back the initial cost of the hybrid system with the savings in fuel costs. If those numbers work out in your particular favor, the GS450h makes for a great luxury sedan.